The 28 metre motor yacht Enigma Astralis, jointly listed for sale by Van der Vliet Quality Yachts and Bernie Challis at IYC, has been sold with Van der Vliet representing the buyer. Built in aluminium by Dutch yard Heesen with exterior and interior design by Pieter Beeldsnijder, she was delivered in 1993 and most recently refitted in 2012/2013. Her interior, with joinery crafted in bird's eye maple in a satin gloss finish, is carpeted throughout and accommodates six guests in three cabins consisting of a master suite with a new king size bed and two twins, all with entertainment centres and full en suite facilities. In addition, there are quarters for four crew in two twin cabins. The main deck saloon is cosy and comfortable with an excellent full headroom of 2.05 metres and offers seating for eight guests in sofas and loose chairs. There is also a built-in drinks cabinet, storage cupboards for crockery and glasses, a fridge, ice-maker and a 26 inch Sony television plus a full entertainment system. The dining area easily blends in with the lounge, being on the port side with formal dining for six guests and yet more storage cabinets. A very spacious aft deck has a large al fresco dining area with built in seating and a built in extendable dining area. In 2013 she received a full hull and superstructure repaint and Vosper zero speed stabilisers were fitted. The main engines, with only 2,500 hours since new, have been disassembled and rebuilt in accordance with the manufacturer’s age recommendations. 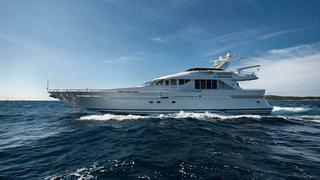 Twin 2,645hp MTU engines give her a cruising speed of 35 knots. Lying in Croatia, Enigma Astralis was asking €1,475,000 with VAT paid.